I adore this ktichen in the home of J. Crew creative director Jenna Lyons. 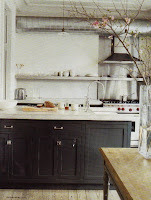 I love the navy blue kitchen island. I think A Ralph colour. Also the concrete bench tops and exposed duct work. This photograph was published in the late great Domino Magazine, the passing of which is just too sad!